Meet the perfect compact wireless DMX controller to compliment any LED lighting fixtures with 3/4/5-channel modes, the Kontrol™ 5 Skywire! Its 5x conveniently labeled red, green, blue, white and amber sliders make for ultra easy color-mixing control. 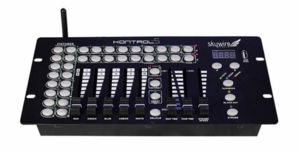 The Kontrol 5™ Skywire will allow you to control up to 16 fixtures composed of 10 channels each and up to 16 programmable scenes. Its sixteen chase banks can contain up to 200 steps composed of saved scenes or manual inputs in any order. On Kontrol™ 5 Skywire's surface, 5 RGBAW/universal channel sliders, quick access fixture and scene buttons and an LED display indicator make for easier navigation of controls and menu functions. Then, for the ultimate in ease of setup, the built-in Skywire™ wireless transmitter provides reliable wireless communication for over 1000 feet, line-of-sight! 512 auto-assigning frequencies in 7 groups (color-coded by an LED indicator) allow up to 7 systems to run simultaneously in the same space, completely free of interference.